Does your return policy allow stolen merchandise to be returned for cash? We certainly hope not! However, the National Retail Federation's Return Fraud Survey says criminals often take advantage of retailers with relaxed return policies. The survey reports that an astonishing 95.2% of retailers have experienced this most popular form of return fraud in the past year. While many retailers are tightening policies, some at the expense of customer service, the retail industry will still lose $9.6 billion in return fraud. The return of stolen merchandise. There are documented cases of thieves picking up an item in the store and then walking it to the return counter. The returns of exchanged merchandise. This is when a customer buys an item and then replaces the item with a broken one in the box and then returns it. I had this happen one time in a store in my region. The thief had a phone of the same type we sold, bit his was broken. HE bought the new item, swapped the new phone for the broken one and returned it to the store. The employee only checked to see there was a phone in the box, not if it was the right one. High inventory shrink rate. This is the amount of inventory lost from one physical count to the next. One great way to protect against this is to implement a system of cycle counts. This is the idea of picking a category in your store and doing a physical count each month. So, in my shoe stores, we did all of the dress shoes one month and then all of the sandals the next month and so on. Rather than having to stay up all night for a full inventory count, we could do a portion of the store in between. A dramatic increase in the number of returns. Once a thief figures you out, he or she has friends that will come and "shop" our store as well. Retailers should keep customer service in mind while writing a return policy. It's a delicate balance to strike, but an obtainable one. First, understand what customers want. Shoppers want their returns to be effortless. They want the returns to have a reasonable time frame, include the ability to receive credit for the merchandise and not be penalized for making a return. Consider the following when creating your return policy. Require a receipt for cash returns. Only refund in the same form of currency used for the purchase. For example, if the item was purchased with a credit card, issue a credit to that same card. If the purchase was made by personal check, many retailers will only issue a refund by mail after 14 days from receipt of the returned merchandise. This allows time for the original check to clear the bank. Consider offering store credits or equal exchanges to limit or eliminate cash refunds. Examine the length of time the store will allow returns. Some retailers limit returns to 30 days, others may allow returns for up to 90 days. Provide gift receipts to increase customer satisfaction. Determine what condition merchandise must be received and consider assessing a 5 to 25 percent restocking fee for opened items, unless defective or prohibited by law. Place your policy in plain view. This will not only make it easier for the customer to understand upfront what the store will allow, it is also a law in many places. Sales receipts are another option for displaying a retailer's return policies. Be consistent in enforcing the return policy without making exceptions for certain circumstances or times of the year. Require identification when accepting returns. Then use a computer database to track returns by customer and note any fraudulent or excessive returns. 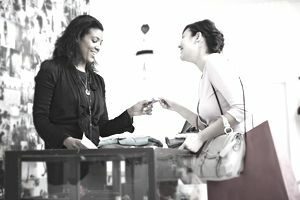 Train employees to spot return fraud and thoroughly understand (and enforce) the store's return policy.